This sightseeing bus tour is a journey around Edinburgh’s gruesome past, while seeing the city’s most famous sites, including Edinburgh Castle, The New Town, Grassmarket, Greyfriar’s Kirk, The Old Town, Holyrood Palace and the Royal Mile. The Conductor will show you where the murders, tortures and executions took place – and where certain restless spirits still linger. Hear about Edinburgh’s grisly history, from Burke and Hare to the hundreds of women drowned or burned as witches. There are also surprises onboard the bus – it was indeed once a funeral bus, so it’s not a surprise that the dead may have left an imprint on the vehicle. This Edinburgh bus tour lasts approximately 1 hour (depending on traffic), and you will be dropped off again at our stop on Waverley Bridge. NOTE: The bus is perfectly safe. On the off chance that a spirit does manifest itself our staff are highly trained to deal with the supernatural and will make sure that no passengers are in any danger from any paranormal activity. The Necropolis Bus Company began in the 19th century as a private funeral bus service. The Necropolis vehicles or ‘Carcass Coaches’ as they were known to Londoners were able to convey the deceased, pall bearers and up to 50 mourners (no standing) to the final resting place. Each bus had an onboard conductor/chief mourner and a special siren or ‘mourning whistle’ to warn pedestrians of the bus’s approach. The sound of the whistle prompted gentlemen to remove their hats and bow their heads as a mark of passing respect. Regular service ran until 1967 when a tragic fire at the company depot in South Dulstead razed the building to the ground and destroyed almost the entire fleet of buses. Only one vehicle was salvaged from the ashes and was locked in a storage facility for 40 years. 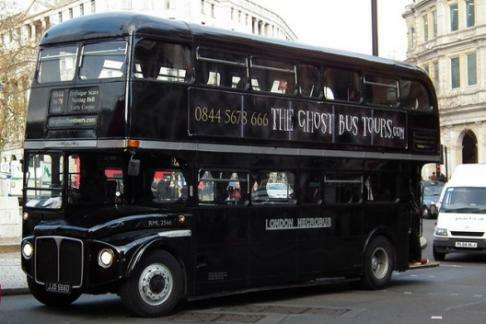 It has now been restored to its original design and is operated by NECROBUS as a sightseeing service in central London. The bus is painted in the company’s traditional colour of midnight black. The interior seating is arranged in ‘railway style’ for comfort and so that passengers can grieve openly and offer condolences to each other. Decorative features include lamps and window curtains, which were always drawn if a coffin was stored in the vehicle overnight. This is based on the superstition that a departed spirit might be trapped by its own reflection in the glass and would be unable to pass on to the other world. It also helped to keep the bodies cool in the summer months. Please Note: The Ghost Bus Tours take no responsibility for items left on the bus, personal items are carried at the owners risk and The Ghost Bus can take no responsibility for items damaged or lost. Smoking, eating and drinks other than bottled water are not permitted on the bus. There are no toilet facilities on the bus. The vehicle is a 1966 Routemaster and it has not been possible to make the entrance wheelchair accessible.